8164 SPE ST. VINCENT (1974) Cruise ships*. Set of 4 overprinted SPECIMEN. Scott Nos 371-4, Yvert Nos 353-6. 6134 SPE ST. VINCENT (1976) Ancient Carib art*. Set of 4 overprinted SPECIMEN. Scott Nos 479-82, Yvert Nos 470-3. 6187 SPE ST. VINCENT (1976) Churches*. Set of 4 overprinted SPECIMEN. Scott Nos 475-8, Yvert Nos 454-7. 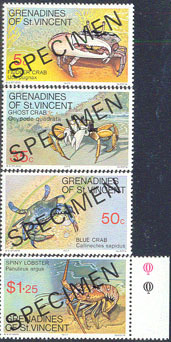 7570 SPE ST. VINCENT (Grenadines) (1977) Crustaceans*. Set of 4 overprinted SPECIMEN. Scott Nos 119-22, Yvert Nos 101-4. 6510 SPE ST. VINCENT (1978) Wright brothers*. Set of 4 overprinted SPECIMEN. Scott Nos 537-40, Yvert Nos 522-5. 8167 SPE ST. VINCENT (GRENADINES) (1979) Sailing regatta*. Set of 4 overprinted SPECIMEN. Scott Nos 166-9. 425 SPE ST. VINCENT (1983) Autos*. Set of 6 specimen pairs. Classic cars. Scott Nos 687-92. Yvert Nos 682-93. 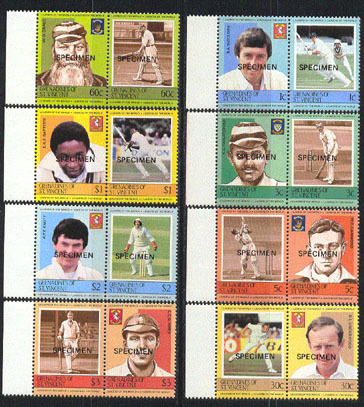 2410 SPE ST. VINCENT (Grenadines) (1984) Cricket players*. 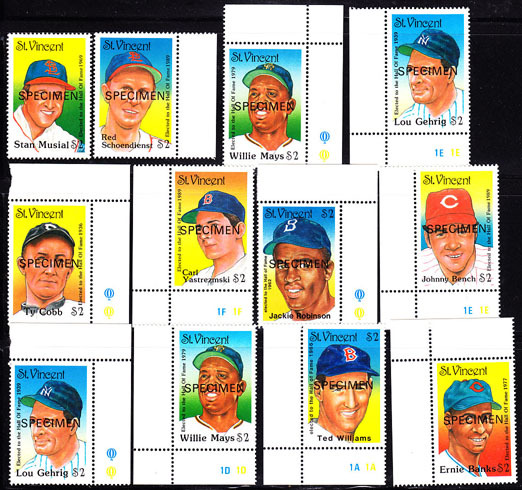 Set of 8 se-tenant pairs overprinted SPECIMEN. Scott Nos 403//17, Yvert Nos 363-70. 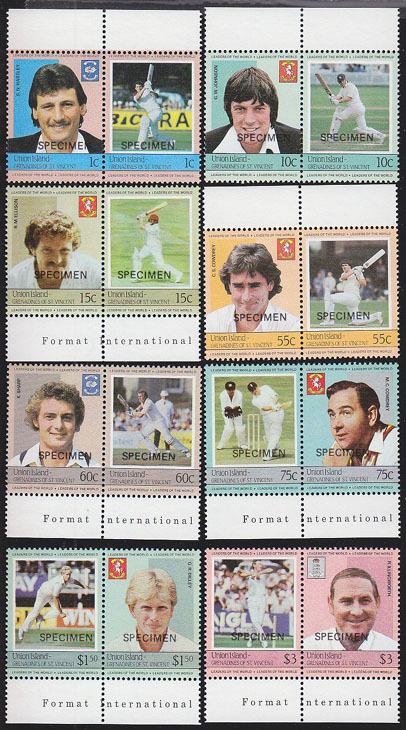 11347 SPE ST. VINCENT (UNION ISLAND) (1984) Cricket players*. Set of 4 se-tenant pairs overprinted SPECIMEN. Scott Nos 126-33. 428 SPE ST. VINCENT (Union Island) (1985) Autos*. Set of 4 se-tenant with labels imperforate pairs. Scott Nos 142/62. Issue of 1/14/85. 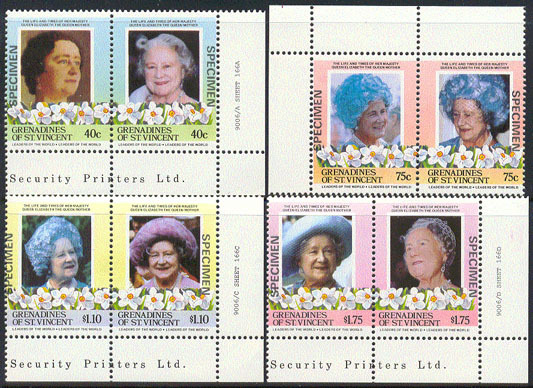 5770 SPE ST. VINCENT (Grenadines) (1985) Queen Mother*. Set of 4 se-tenant corner pairs overprinted SPECIMEN. Scott Nos 492-500, Yvert Nos 424-31. 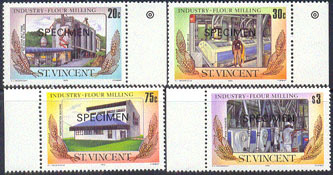 6026 SPE ST. VINCENT (1985) Flour milling*. Set of 4 corner singles overprinted SPECIMEN. Scott Nos 882-5, Yvert Nos 878-81. 7574 SPE ST. VINCENT (Grenadines) (1985) Crab*. Urchin*. Whelk*. Conch. Set of 4 overprinted SPECIMEN. Scott Nos 472-5, Yvert Nos 374-7. 7802 SPE ST. VINCENT (1985) Native instruments*. Set of 4 overprinted SPECIMEN. Scott Nos 845-8, Yvert Nos 858-61. 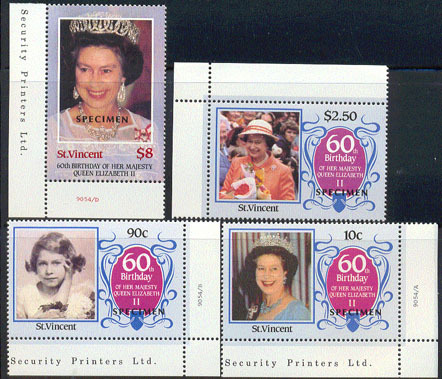 2967 SPE ST. VINCENT (1986) Queen Elizabeth II*. Set of 3 corner se-tenant pairs and 1 single overprinted SPECIMEN. 60th birthday. Scott Nos 923-6, Yvert Nos 917-20. 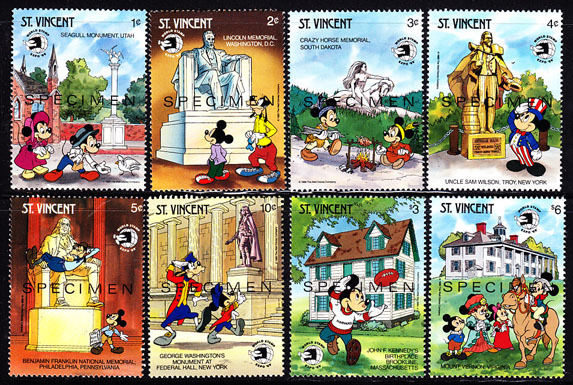 15815 SPE ST. VINCENT (1989) Mickey Mouse and friends at various landmarks. Set of 8 overprinted SPECIMEN. Scott Nos 1256-63, Yvert Nos 1147-54. 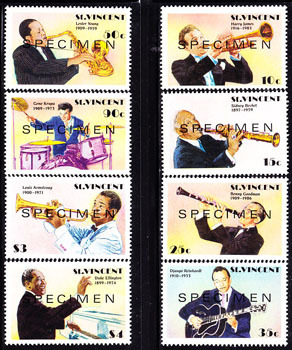 16703 SPE ST. VINCENT (1989) Jazz and big band musicians. Set of 8 overprinted SPECIMEN. Scott Nos 1142-9, Yvert Nos 1089-96. 17413 SPE ST. VINCENT (1989) Baseball Hall-Of-Fame players. Set of 12 overprinted SPECIMEN. Scott Nos 1211-22, Yvert Nos 1165a-m.